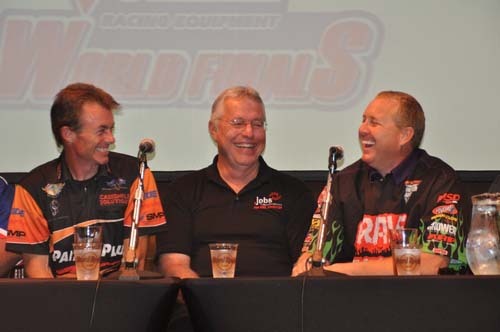 MEMPHIS, Tenn. -- IHRA's biggest and most prestigious event kicked off in the most exciting way possible on Thursday - with a huge rock-n-roll bash on world famous Beale Street during the IHRA Summit Racing Equipment World Finals Media Day at the Hard Rock Caf? in Memphis, Tenn.
IHRA drivers Clay Millican, Bruce Litton, Ron Hope, Randy Brown and Chase Huffman were on hand to talk about this weekend's championship finale at Memphis International Raceway, joining IHRA CEO Jason Rittenberry, IHRA VP Skooter Peaco and Memphis International Raceway GM Pam Kendrick. 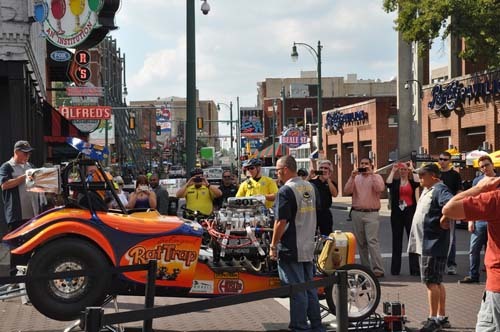 Beale Street was blocked off for Thursday's rocking IHRA party as Top Fuel Dragsters, the world famous Grave Digger monster truck the Rat Trap Fuel Altered and more lined the iconic street allowing for fans to have a closer look and get autographs. 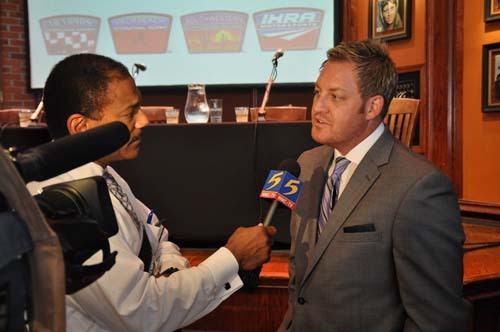 In recognition of the race and the fan celebration to be held at the Hard Rock Cafe on Memphis' legendary Beale Street, Memphis Mayor A.C. Wharton officially declared in a proclamation that Thursday, October 10 was "IHRA World Finals Day" in the city. The Rat Trap Fuel Altered fired up right on iconic Beale Street. IHRA Top Fuel stars Clay Millican and Bruce Litton completed the day with a tour of Memphis' top morning shows. Nitro Jam will feature professional competition in Top Fuel Dragster, Prostalgia Nitro Funny Car, Fuel Altered and Nitro Harley plus a huge show feature Grave Digger as the world's most recognizable race machine takes on the 30,000 horsepower Super Shockwave jet-powered '57 Chevy. Among the highlights of this year's race is the return of six-time IHRA Top Fuel World Champion Clay Millican who will return to the IHRA for the first time in five years to take on longtime rival Bruce Litton in a 320 mph, side-by-side Top Fuel showdown. this weekend's IHRA Summit World Finals. Tickets to the IHRA Summit Racing Equipment World Finals are available online at www.nitrojam.com or by calling MIR at (901) 969-7223. Don't miss the return of Clay Millican and Nitro Jam and the crowning of IHRA's 2013 World Champions the weekend of October 11-12 at Memphis International Raceway.